Madman was directed by Joe Giannone. Yet another Friday the 13th inspired film, there are a couple of things to enjoy. A cool electronic score, some nice lighting and atmosphere, and quirky performances make this part slasher film/part good old fashioned monster movie, an interesting find. A group of counselors are sitting with some of the kids as TP (Tony Fish) croons a tune designed to instill fear in everyone. Max (Carl Fredericks), the camp proprietor, tells his own story. It's the tale of "Madman Marz," a farmer who lived in a nearby house. He was a brutal, heavy drinker and often abused his wife and two children. One night ("a night like tonight" says Max), Marz (played by Paul Ehlers) went off the deep end and brutally butchered his family with an ax. He then walked into a local tavern and calmly lifted the bloody warm ax onto the bar and ordered a beer. When the town found out, ten men apprehended him and hung him from a tree. One of them took the ax and struck the farmer in his face, making a deep bloody gash. When the locals returned the next day, Marz was missing - and so was his murdered family. The bodies were never found. Supposedly, the killer is still on the loose looking for people to hang from a tree...or chop their heads off. The story goes that if you yell his name, he will come for you. Richie (Jimmy Steele) thinks the story is funny. He yells Marz's name out and throws a rock towards the killer's old house, breaking a window. Max jokingly admonishes him and then wishes everyone well because they're about to go on their break the next day. Besides TP, the counselors are Betsy (Alexis Dubin), Stacy (Harriet Bass), Dave (Seth Jones), Bill (Alex Murphy) and Ellie (Jan Claire). One of the little girls is frightened by the storytelling. Betsy tries to calm her down by saying that it's all make believe. When TP approaches her to try and get together with later, Betsy acts cold and tells him she was not amused by the Marz song.The others hear the two argue and Stacy tells TP to lay off. As the group heads back to the cabins, Richie notices a figure in a tree who has been watching them. When the figure climbs down, Richie decides to go off on his own, away from the others. He follows the shadowy figure back to the dilapidated Marz house. Meanwhile, Stacy tries to comfort Betsy. She tells her friend that she shouldn't rush into things with TP. Outside, TP tries to win a bet with Max that he can pull an ax which is stuck in a tree trunk. He can't...and even together, the two aren't strong enough to do it. Later, Stacy sees Dippy (Michael Sullivan) the cook...somewhat of an alcoholic...relaxing with a bottle on his stomach. Stacy is amused and leans over him, telling him that the bottle is empty. Dippy gets up and walks over to a closet in the cabin. He opens the door and standing behind it is Madman Marz. The killer slits the cook's throat and drags him back to his house. Richie is still snooping around. He happens to be looking out of a window in the attic and sees Marz racing out towards the cabins again. While the adults are sitting at a table relaxing, Betsy again expresses her annoyance with the campfire stories. Max promises to exclude the youngest children in the future - then leaves and heads into town. TP apologizes to Betsy and the group for making a scene earlier in the night....before he and Betsy spend intimate time together in a whirlpool. A few of the boys have noticed that Richie still hasn't returned. TP decides to go look for the kid in the woods since Richie was his responsibility. After telling Betsy to stay in the office and wait for him, he takes a flashlight and begins his search. Unfortunately, he wanders into Madman Marz's path. The killer suddenly puts a noose around TP's neck and drags him to a tree and hangs him. TP tries to escape by grabbing onto a branch and hoisting his body up. Marz finishes the job by pulling his body down, thereby snapping his neck. Betsy becomes impatient and leaves the office. She goes to the cabin and tells Stacy and Dave that she saw something lurking around the camp. Dave puts on his jacket and grabs a searchlight to look for TP. Madman Marz effortlessly picks up the ax still stuck in the tree trunk. Dave finds TP's flashlight on the ground in the woods. He then bumps right into his friend's body hanging from a tree. Marz is nearby and cuts the rope with the ax. TP's body falls on Dave and the poor guy scrambles to get away. He tries to hide as the killer strikes at him a few times. Daves temporarily eludes him but he stumbles and Marz finally hits his mark. Stacy gets a bad feeling about this and she and Betsy go back to the office. She tells Betsy she's going to look for Bill and Ellie. She finds them naked in a tent (surprise!) and tells them to join her and Betsy when they're done. Stacy then gets into her pick-up truck and leaves to find Dave. She finds a horrific sight - Dave's decapitated body. She screams and runs back to the pick-up. Now it's Bill and Ellie's turn to go into the woods and look for someone who hasn't returned! They separate and Ellie sees Madman standing over a body near the pick-up truck. She runs back to Bill and together they walk over to it. The body is suddenly missing and Bill tries to start the vehicle. It's not going anywhere so he gets out checks under the hood. He finds Stacy's head and rushes to get a blanket to cover it. But not before Ellie sees it and becomes hysterical. They manage to start the car but Madman Marz grabs onto the vehicle and pulls Bill out. The truck crashes into a tree and Ellie stumbles out. Looking back, she sees the killer raising her boyfriend in the air and snapping his back. Ellie tries to find Betsy but she's nowhere in sight. In fact there's no one around as she runs through one of the cabins. Madman finds her and tries to hit her with the ax. And then...Ellie hides...in a refrigerator! Yes, a refrigerator. Thinking the coast is clear, she makes a run for it. But just as she's about to make it outside, she's struck in her chest. Finally, Betsy gets the urge to go out herself. Peeping into one of the cabins, she sees a body on the floor and runs back to the office to call for help. She gets a hold of Max and tells him to come back to the camp immediately. She then picks up a shotgun and heads back to the cabin. Madman Marz puts Ellie's body up against the window and Betsy fires at her corpse. The ruckus wakes up the kids...and Betsy directs them to a school bus. She starts driving away but Marz sticks his arm in the door and tries to get in. Betsy is able to fight him off and tells the eldest boy to drive the bus to the police station. Hoping to find survivors, she enters Madman's house, but is quickly overtaken by him. Marz drags her down to the basement and impales her body on a hook. Before her death, Betsy manages to knock over a candle and the house is set ablaze. Max drives up to the camp at that moment and sees Richie in a daze. The boy can only say that "Madman Marz is real..."
Yes, there are many unanswered questions in this movie. What is Richie doing for most of the film anyway? Why is the cook named 'Dippy' and why does he die so soon? Why aren't any of the little kids killed? Why does Marz resemble some kind of monster? What does Bill see in Ellie? Why does Ellie hide in the refrigerator? Why is the actor who plays Max such a ham? Why is there a number called "Song of Madman Marz" at the end of the movie? Who penned this magnificient musical elegy and why wasn't it released as a single? Who cares? Madman is one seriously guilty pleasure and a shining example of early '80s slasherdom. It's a pleasure to see Alexis Dubin (so terrific in Dawn of the Dead) in another horror flick. However, to go into the merits of the acting would be a waste. At times, it's amateur night - but this is a cast that's very average and therefore more "real." And that's a plus in this type of story. 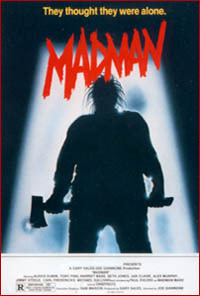 Madman is a solid backwoods slasher flick, most certainly underrated. Good death sequences... so if you like axes slamming down on heads and blood spurting from decapitated bodies, the special effects alone are worth the price of admission.